Number one is about the salvation hope of Israel, as we have demonstrated. It’s the time of the end. Daniel foretold the Great Tribulation. Where does Revelation 20 posit the tribulation? At the end of the millennium. Again we’re dealing with the resurrection to eternal life (Daniel 12:2) just as 1 Corinthians 15 is talking about the resurrection for eternal life, and Revelation 21 as well. Notice that Daniel12 is about the vindication of martyrs, the time of the rewarding of the prophets. Likewise, Revelation 11 is the time of the dead that they should be judged and the time of the rewarding of the prophets. This is a direct allusion back to Daniel 12. Daniel 12 explicitly tells us that the resurrection would be fulfilled, “when the power of the holy people is completely shattered” (v. 7). Likewise, Paul said the resurrection of 1 Corinthians 15 would be when the law that is the strength of the sin would be fulfilled. Here is a significant fact. The only law in scripture that is ever labeled as, described as, the “strength of sin” was Torah. Patently, the gospel is not the strength of the sin. 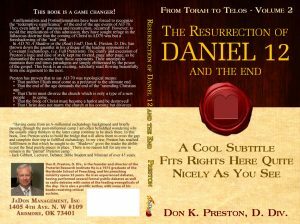 Thus Paul agrees with Daniel in positing the end-of-the-millennium resurrection at the end of Torah, the strength of sin, when Daniel posits the end-of-the-millennium resurrection as a time when Israel’s power would be completely shattered. My argument here is really quite simple. Daniel 12 is the resurrection of 1 Corinthians 15, the end-of-the-millennium resurrection of Revelation 20. (Now to my knowledge, every man on the dais today agrees with that except Kenneth Gentry. He once applied Daniel 12:2 to the “end of the world” (Kenneth Gentry, The Greatness of the Great Commission, (Tyler, Tx. ; Institute for Christian Economics, 1993), 142). He now says, “Daniel appears to be presenting Israel as a grave site under God’s curse; Israel as a corporate body is in the dust (Daniel 12:2; cp. Ge. 3:14, 19). In this he follows Ezekiel’s pattern in his vision of the dry bones, which represents Israel’s ‘death’ in the Babylonian dispersion (Ezekiel 37). In Daniel’s prophecy many will awaken, as it were, during the great tribulation to suffer the full fury of divine wrath, while others will enjoy God’s grace in receiving everlasting life” (He Shall Have Dominion, (Draper, VA.; Apologetics Group, 2009), 538). Therefore, the end-of-the-millennium resurrection of 1 Corinthians and Revelation 20, was, or will be, accomplished when the power of the holy people is completely shattered. It is critical to realize that Daniel emphatically tells us that the kingdom of Messiah would never be destroyed (2:44; 7:13f). Similarly, Jesus said his word will never pass away. It cannot therefore, be suggested that the resurrection of Daniel 12 anticipates the resurrection at the end of the Christian age. Only one age was to come to an end, and that is the age represented by the Jerusalem Temple (Matthew 24:1-3). For an exhaustive study of Daniel 12 and the Resurrection, including how it relates to the doctrine of Blood Atonement, be sure to get a copy of my book, The Resurrection of Daniel 12:2: Future or Fulfilled? This book is a major study not only of the resurrection, but of Blood Atonement as well. Stay tuned for more on Blood Atonement!